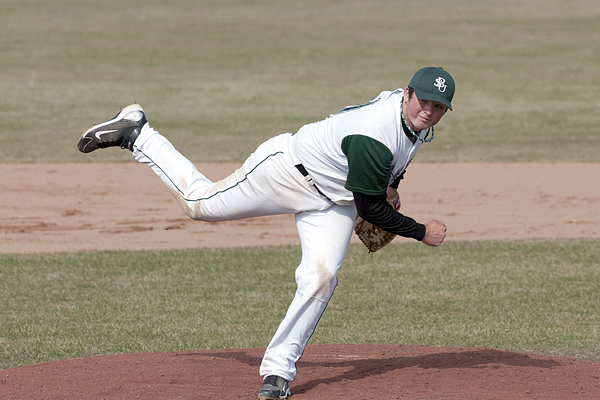 Five out of the last six contests the Bemidji State University baseball team have been involved in have been decided by one run. Tuesday, the Beavers split a nonconference doubleheader with No. 18 Minnesota State University, Mankato at the H.H.H. Metrodome, as BSU won game one 2-1 in 11 innings and lost game two 1-0. MSU (4-2) produced one run in the fourth to take a 1-0 lead in game one, but the Beavers (2-6) scored in the top of the sixth and the top of the 11th off two mistakes by the MSU pitching staff. Junior Zach Braun (C, Lakeville, Minn.) started the sixth with a double and would score on a wild pitch to tie the game 1-1. BSU scored a run in the 11th with two outs on a pitch that hit senior Matt Ellinghuysen (3B, St. Charles, Minn.) with the bases loaded and allowed senior righty Jaryd Marks (Cottage Grove, Minn.) to stroll across the plate for what would be the game-winning run. The win against the nationally ranked Mavericks marked the first win for BSU since defeating then-No. 8 St. Cloud State University 5-4 in a mid-week home game last season. Marks went 2-for-5 in game one to guide the Beavers’ eight hits. He recorded a double in the 11th and would eventually post his second run of the season. Junior right-hander Miles Campbell (Eden Prairie, Minn.) started for BSU and allowed the one earned run on five hits over 6.0 innings pitched. Senior Logan Kalis (OF/RHP), Little Falls, Minn.) hurled the last four innings and allowed just two hits with six strikeouts. In game two, Marks went the distance and gave up just one hit to MSU, but lost after giving up one earned run in the fourth after issuing walks to the first two batters of the frame. He fanned five batters in the loss. BSU scattered four hits in the game. The Beavers conclude their time at the Metrodome March 4 against University of Minnesota Duluth in a nonconference doubleheader, which is set to begin at 9:15 p.m.